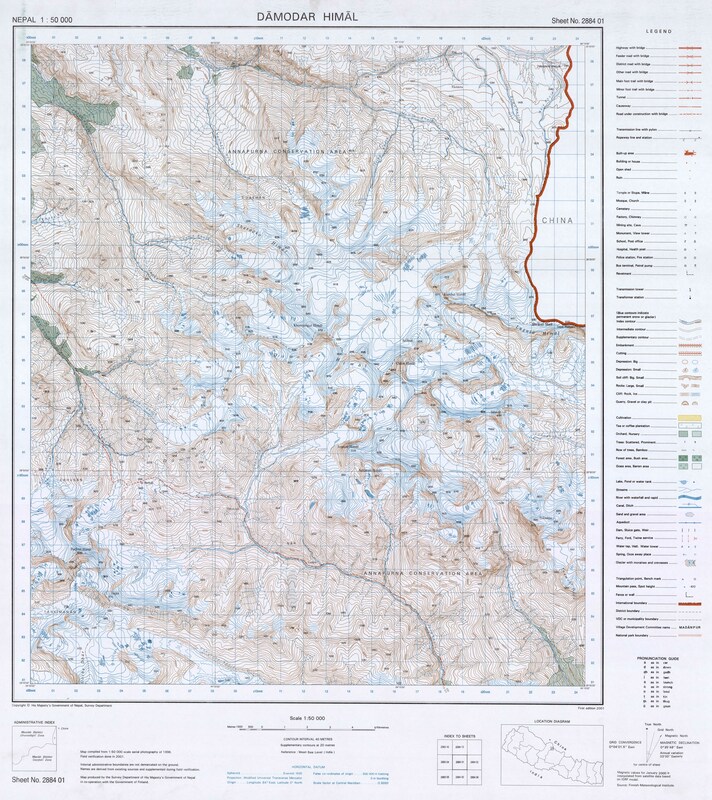 Nepal Govt 1:50000 topo maps: 2984 13 Damodar Kunda; 2884 01 Damodar Himal. 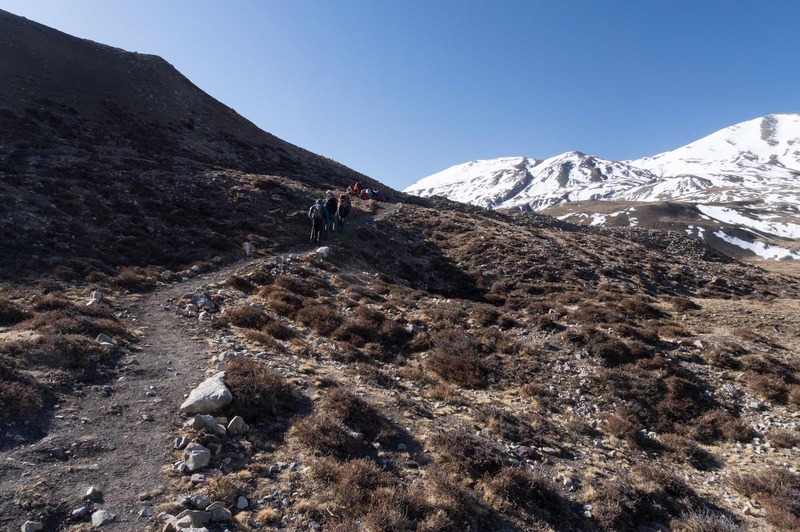 On the day’s “to do” list was an easy 5.5-kilometer walk on a clearly defined trail along the north slope of the Namta Khola, following it all the way to the toe of Khumjungar Glacier. 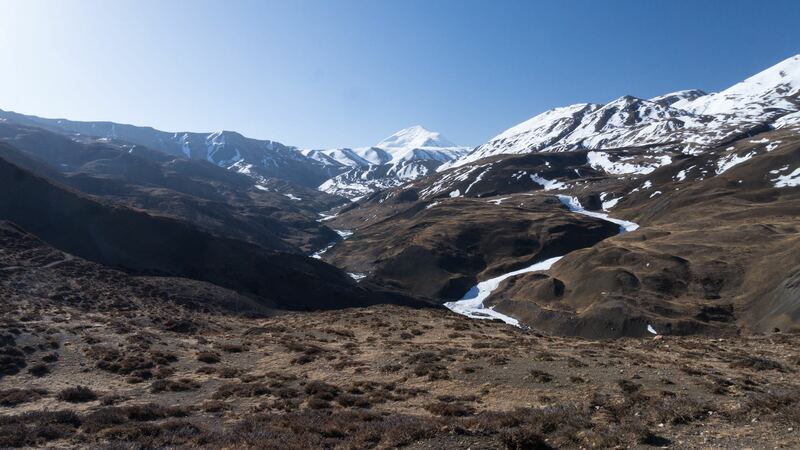 Located there – about 260 meters higher in altitude – is a campsite known as the Japanese Base Camp, presumably because a Japanese climbing expedition used it as a base camp for their ascent of one of the nearby peaks. We set off around 7:15 and, as the images show, it was more of the sunny weather we had for most of the trip. About a half-hour later, I stopped on the trail to take the photos you see above and below. First I looked back at some of the approaching porters and a couple of my fellow trekkers. Visible in the image is the row of small boulders. I figured that it was the work of the Dhi and Yara villagers keen on developing the trekking route through their district. 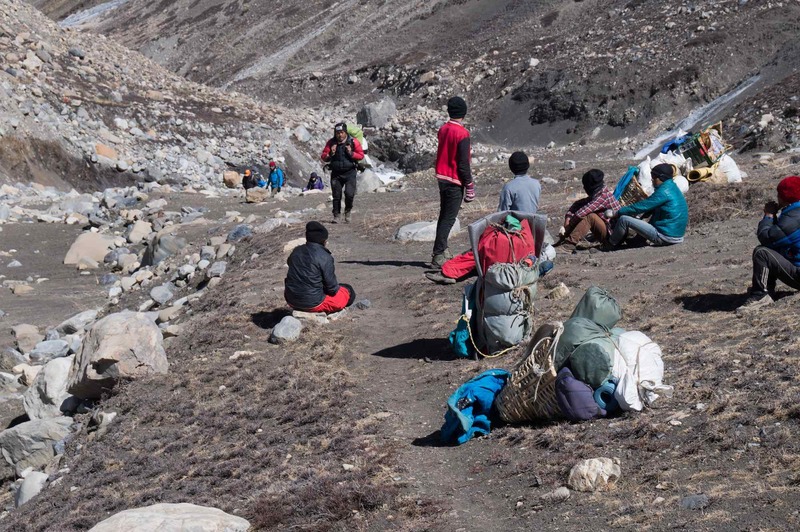 Then I turned around and looked up the trail with yet more porters and trekkers. The snowy peaks would increasingly dominate our views for the next three days – we were now in the mountaineering phase of our trip! 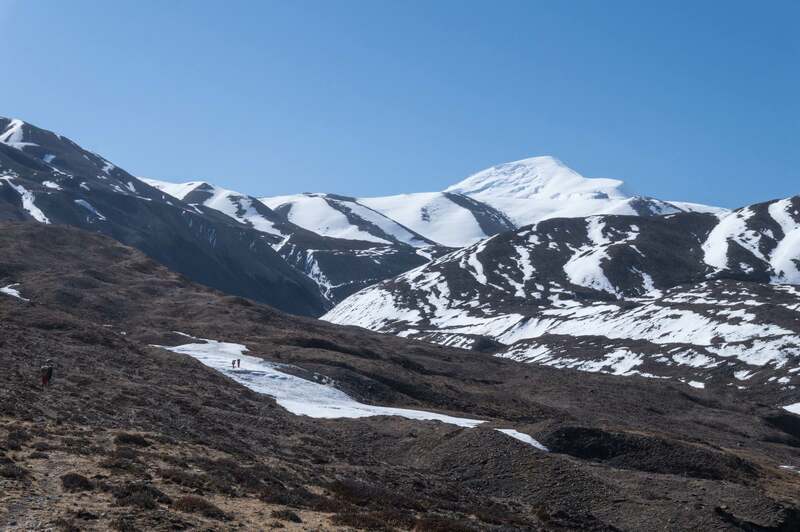 The trip notes had even recommended mountaineering boots and crampons as essential for at least the crossing of the Saribung La a couple of days later. We passed by a large rock cairn and down below we saw a herder’s corral. 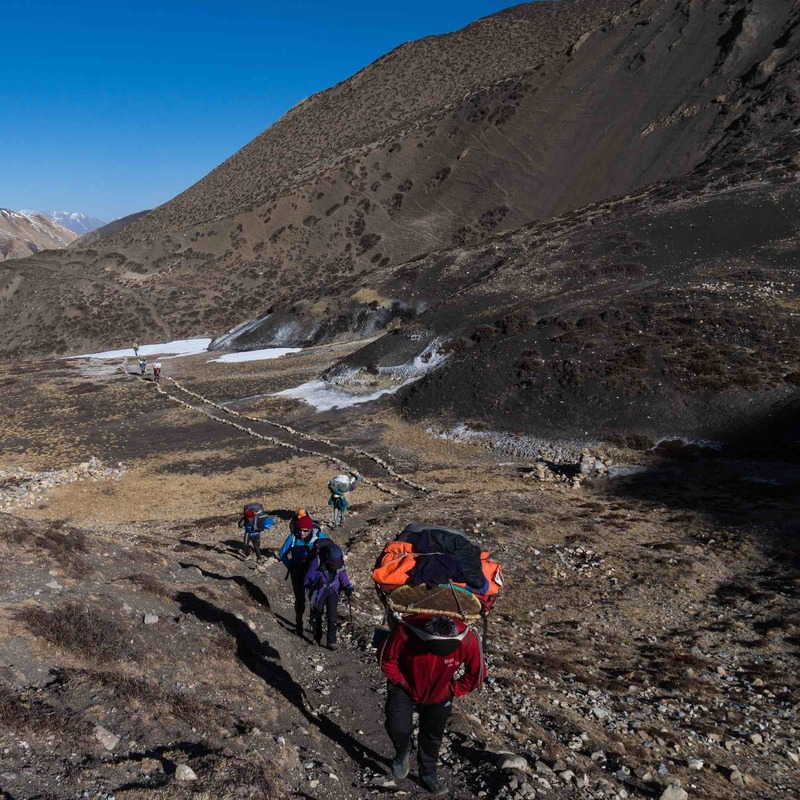 Other than the retreating climbing party at Ghuma Thanti, we had seen no one since leaving Luri Gompa. No herders, no pilgrims, no trekkers. Perhaps things get a bit busier later in the season? 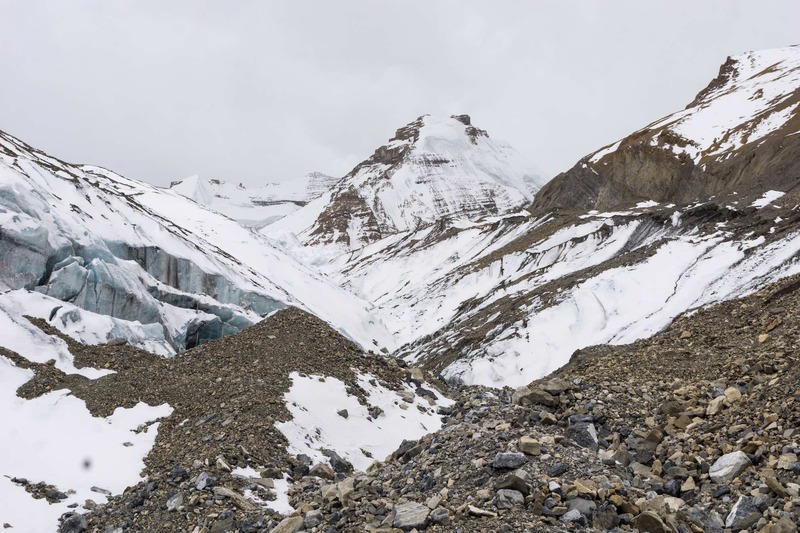 Two porters can be seen on the patch of snow in the bottom third of the image below. 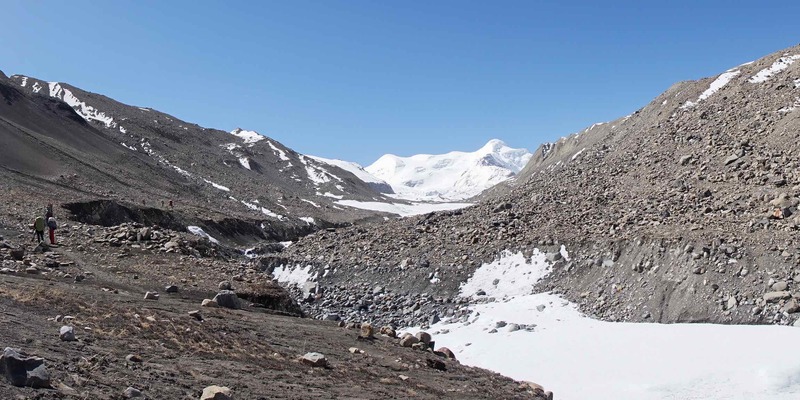 They would continue over the upcoming ridge and then head down to the Namta Khola river bed and around the corner towards our campsite to the south. It was late April and the river was a mere trickle with parts of it frozen. 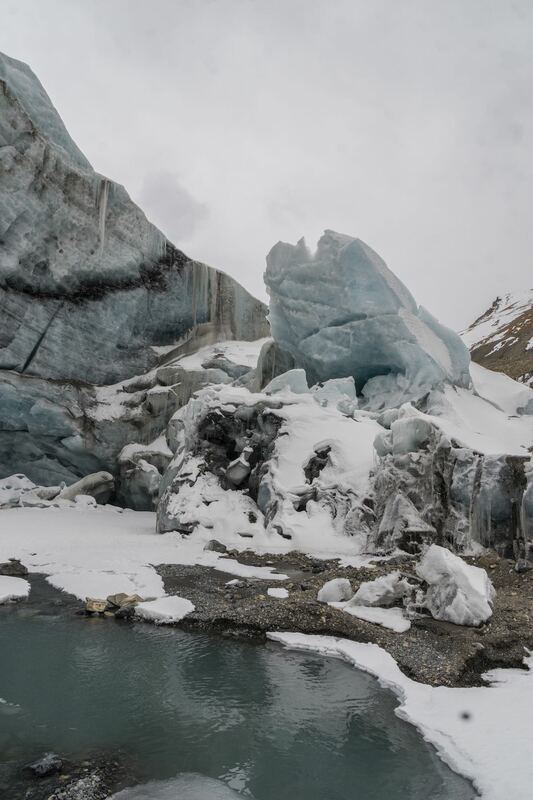 It would look different in August or September with a summer’s worth of glacial melt streaming down. 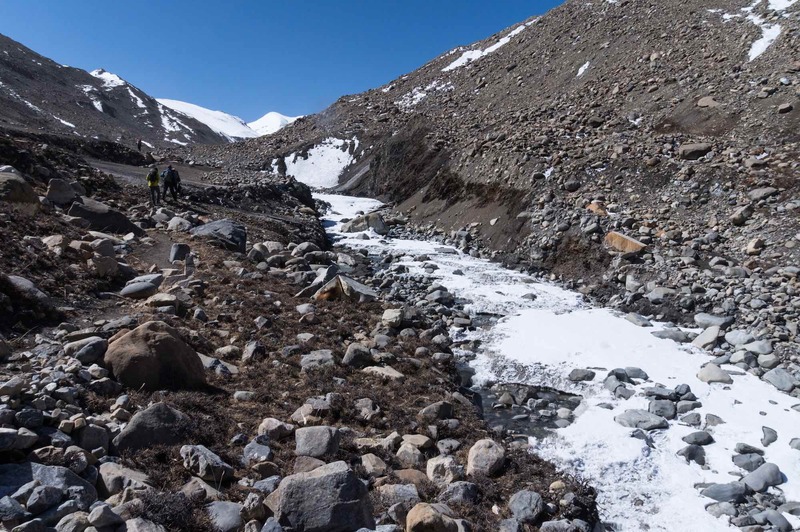 Then trekkers may have to do some wading to get across; we would not have to do any of this. 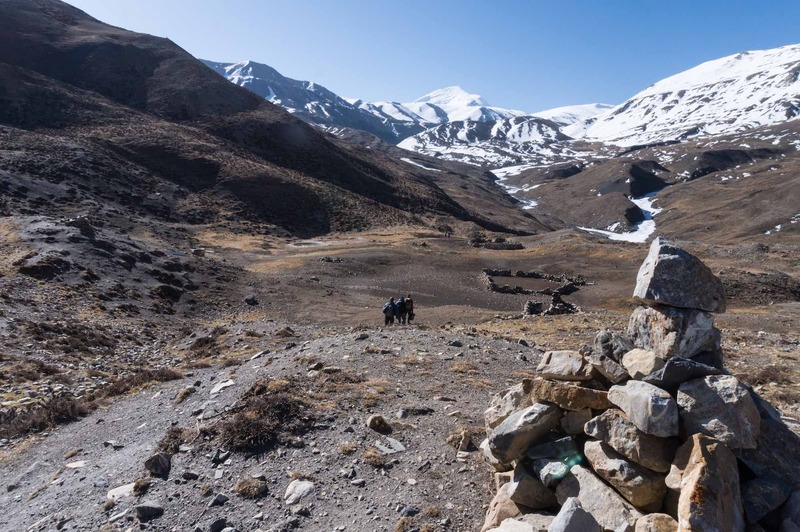 Two hours into the morning’s walk – and perhaps a half-hour from our campsite, the spot below became a gathering spot for five of our ten porters. Approaching them is the sirdar, the one responsible for organizing them each morning. Behind them is our trip leader with a couple of my fellow trekkers. 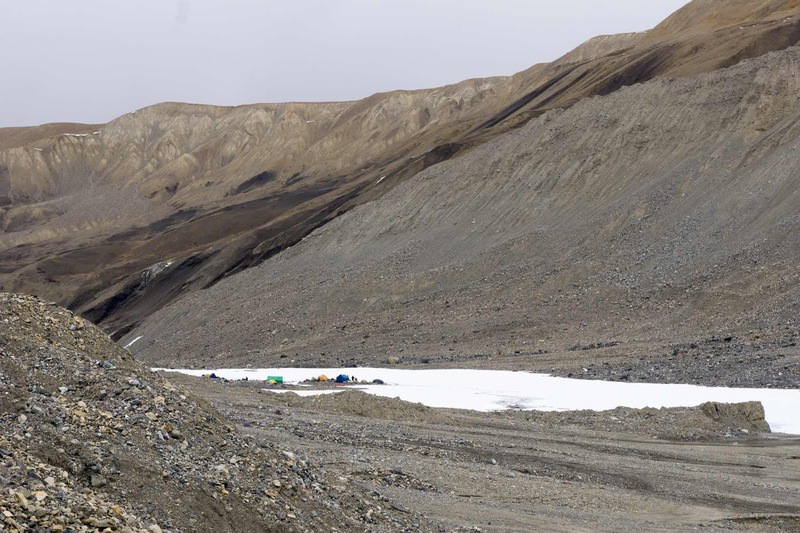 By 10:00 we had reached the outskirts of the Japanese Base Camp on the Khumjungar moraine. I turned around to take a few more shots of the terrain we had just walked up. The one above has Rob taking a short rest; the one below also looks down the valley but I’ve stepped back to include the prayer flags that some trekking or climbing party had set up during their stay. 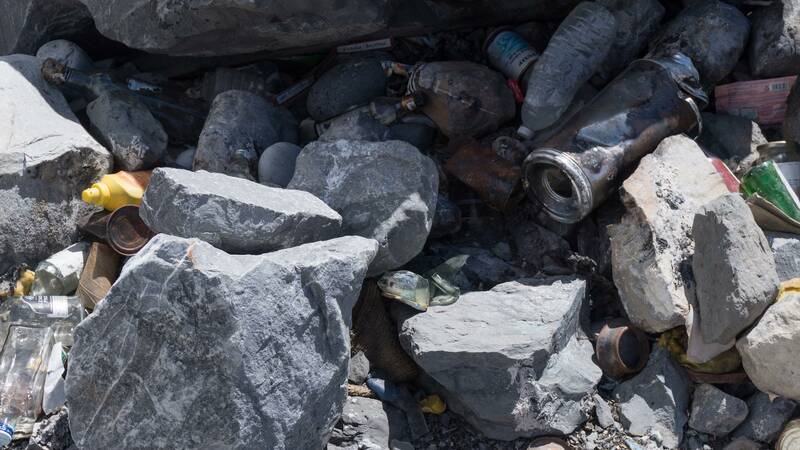 Not far from the prayer flags was a small garbage dump with rusted cans and a small collection of empty whisky bottles. There are a number of peaks in the mid-5000’s and Bhrikuti Shail (6361) on the Nepal/Tibet border a couple of kilometers to the east. There are also Khumjungar (6759) and Chhib Himal (6650) and other possible climbing objectives to the south, including Saribung Peak (6328). 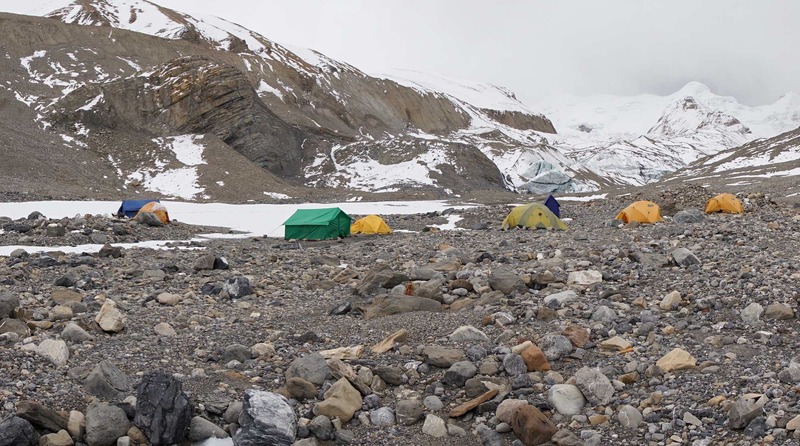 All would involve leaving Base Camp for a High Camp before the ascent. Hopefully, the whisky in those bottles was savored in celebration! Looking beyond the prayer flags I could see that the cook tent was already up on the other side of the patch of snow. It is almost dead center in the image below. In the early afternoon, the weather would turn to overcast and we would get a flurry of snowflakes. 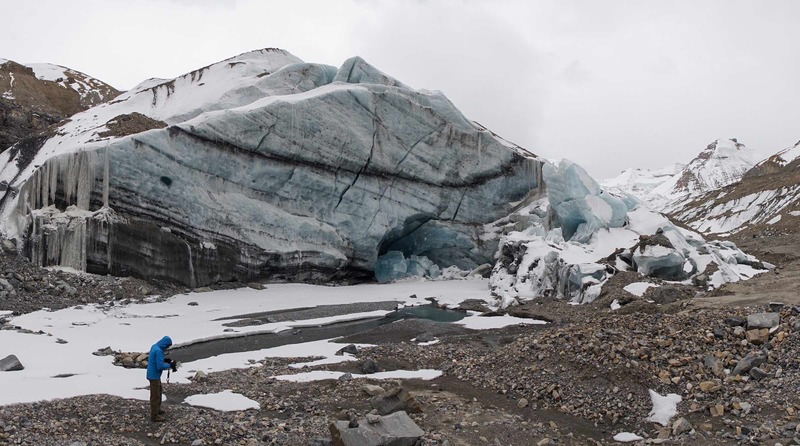 We had ample time to go for a ramble up towards the glacier; the pix below all figure with bits of broken mountain and chunks of ice and snow. What would we do if one of us actually had a severe case of altitude sickness or HACE (high-altitude cerebral edema), or HAPE (high-altitude pulmonary edema)? While the protocol is to descend immediately at all speed, given our route the affected person would not be able to go down quickly enough. 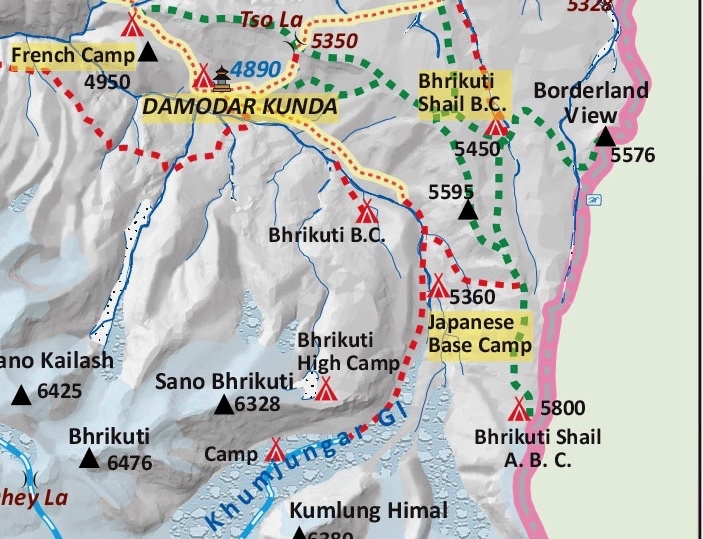 For example, we were at 5250 at Japanese Base Camp; it would take four hours to get back to Damodar Kunda and it was less than 300 meters lower. Another six hours and we’d be back at the Batsyak Camp but it is still at 4890. And Ghuma Thanti? 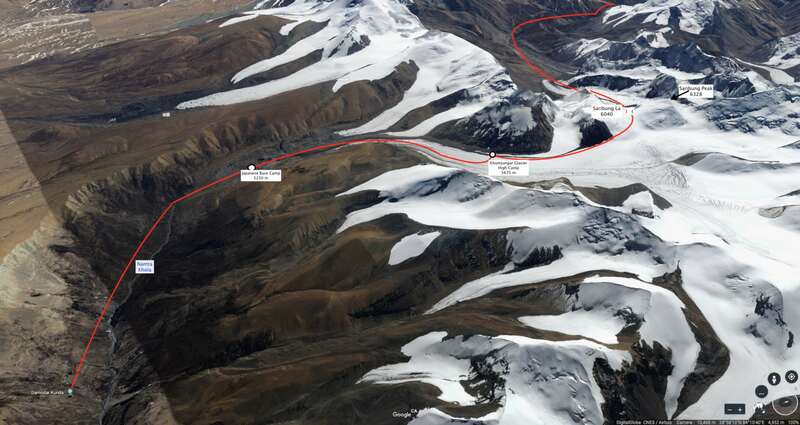 Another six hours and an altitude of 4750, only five hundred meters lower than our start point many hours – perhaps a couple of days – previously. This would not do. Calling in a helicopter is the obvious answer in such a case but doing so will not necessarily result in an immediate rescue. 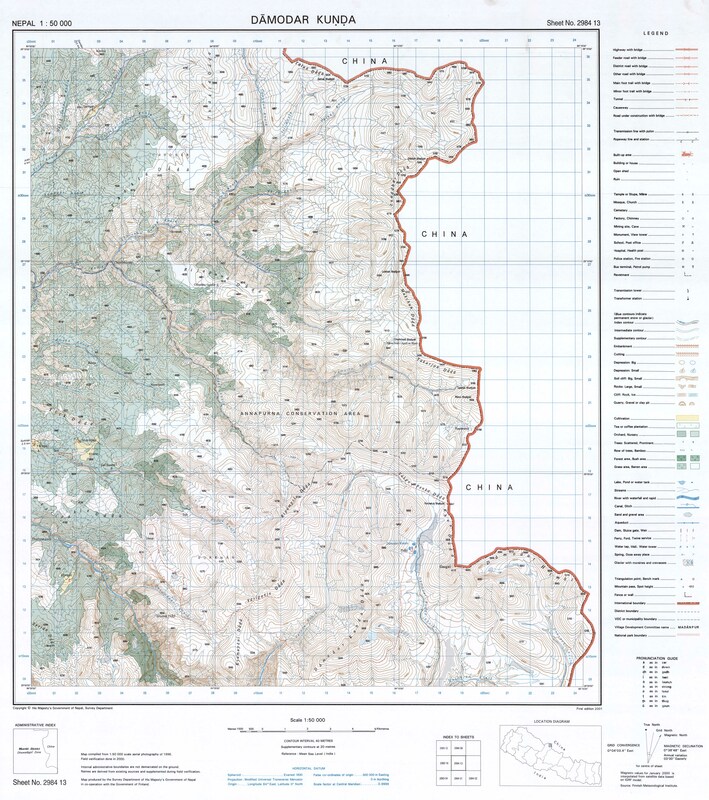 Sat phone in the afternoon, for example, and it is unlikely that one would arrive until the next morning, especially given our fairly remote location east of the Kali Gandaki. The afternoon winds also factor in. Our trek leaders would have to deal with just such an incident. At our Japanese Base Camp, one of our porters showed signs of HACE (High Altitude Cerebral Edema). Shortly after arriving at the campsite, he would collapse, lose consciousness, and be revived. Soon he was placed inside a bag similar to one invented in 1990 by Igor Gamow of the University of Colorado. 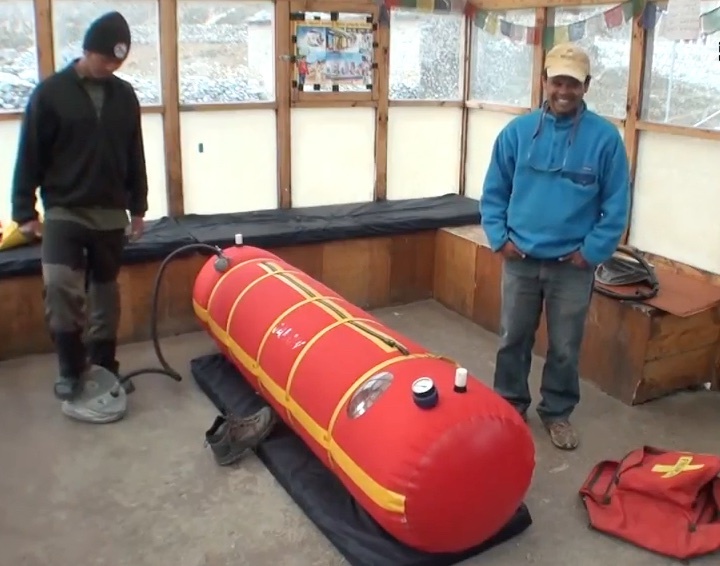 A Gamow bag (pronounced Gam-Off) is an inflatable pressure bag large enough to accommodate a person inside. A patient can be placed inside the bag which is sealed and inflated with a foot pump. Within minutes, the effective altitude can be decreased by 1000 to as much as 3000 meters (3281 to 9743 feet) depending on the elevation. The bag is pressurized to 105-220 mm, pressure gradient is regulated by pop-off valves set to the target pressure. It is primarily used for treating severe cases of altitude sickness, high-altitude cerebral edema, and high-altitude pulmonary edema. The next morning, after the porter collapsed a second time, it was decided to call in a helicopter. (I am not sure about this – perhaps the decision to call had already been made before he collapsed.) When we set off from camp the trek leader and another staff member stayed behind with the affected porter and a second porter with a knee problem. 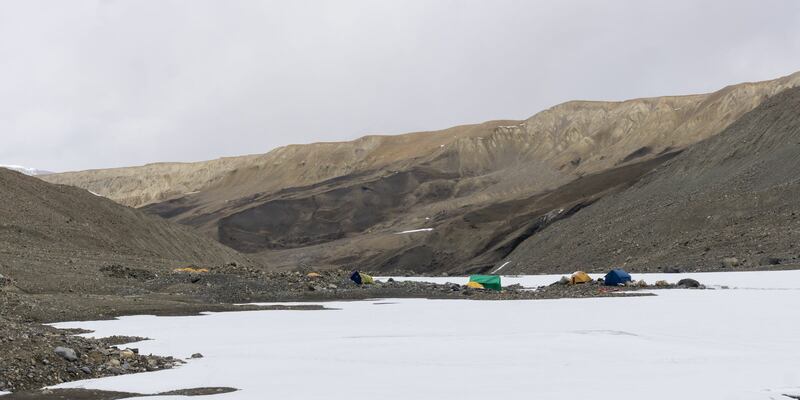 We would hear a helicopter sometime later while we were making our slow ascent up the lateral moraine to High Camp. Word received at the end of the day informed us that the porter was recovering nicely and would be okay, as would the one with the knee injury. 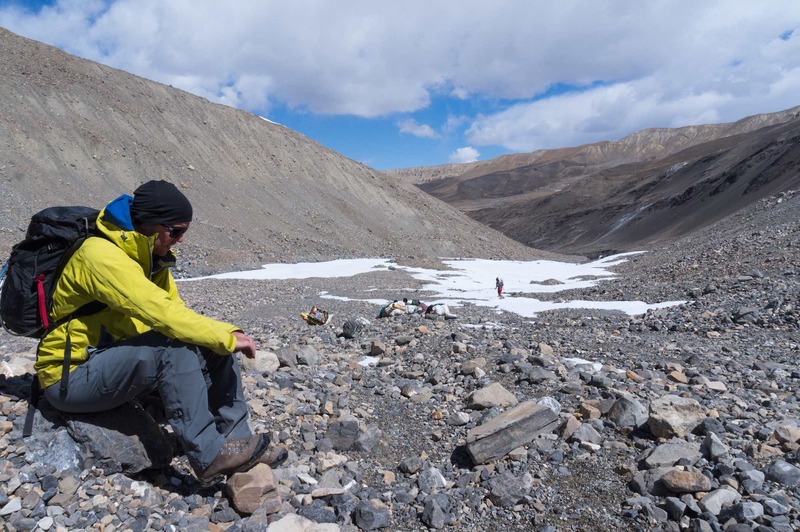 The incident brought home the potentially fatal consequences of rapid altitude gain, a problem no doubt compounded with the physical exertion needed to carry 30 kilograms’ worth of client and camp gear from one camp to another. Something I wonder about is this: in both this incident and in the one I described in this post (here), it is a porter and not a trekker/client who suffers from HAPE/HACE. In both cases, the clients seem to fare okay. To be clear, however, so do most of the porters! Given the 80,000 trekkers walking in the Himalayas each year, some stats on how many actually suffer from HAPE/HACE would be useful. The Wiki article on HACE mentions 1% of those who go up to 4000 meters but in Nepal you are often above that. 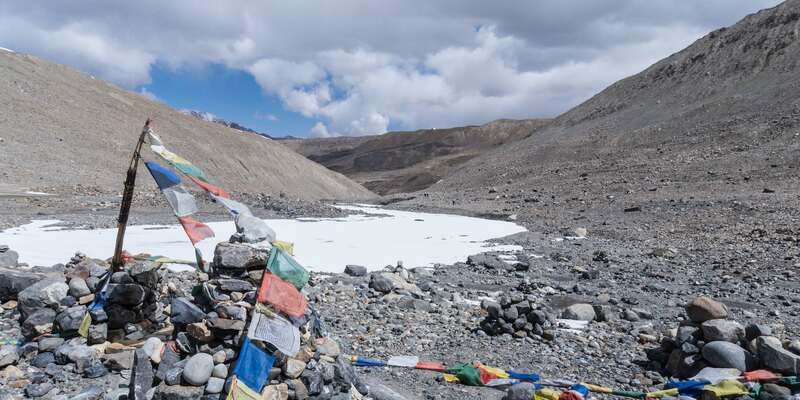 One explanation offered by the guide was that the night before the porters had slept in the pilgrims’ shelter at Damodar Kunda where a Hindu pilgrim had supposedly died the year before. 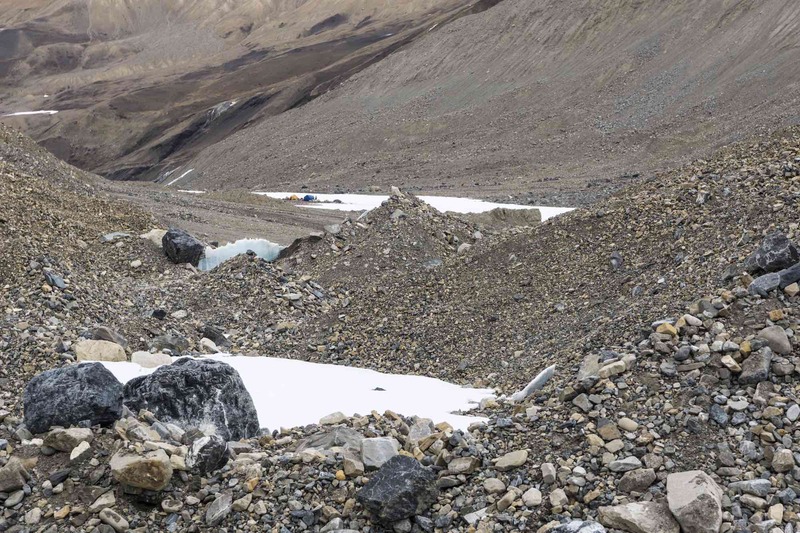 Given the traditional Tamang worldview, the notion that some bad karma had been left behind would explain the cause of the porter’s misfortune. I never did pick up a porter’s load and try walking with it, but a load of at least 30 kilograms is what each of them was dealing with. Meanwhile, my pack weighed at most 10 kilograms. 30+ kg. 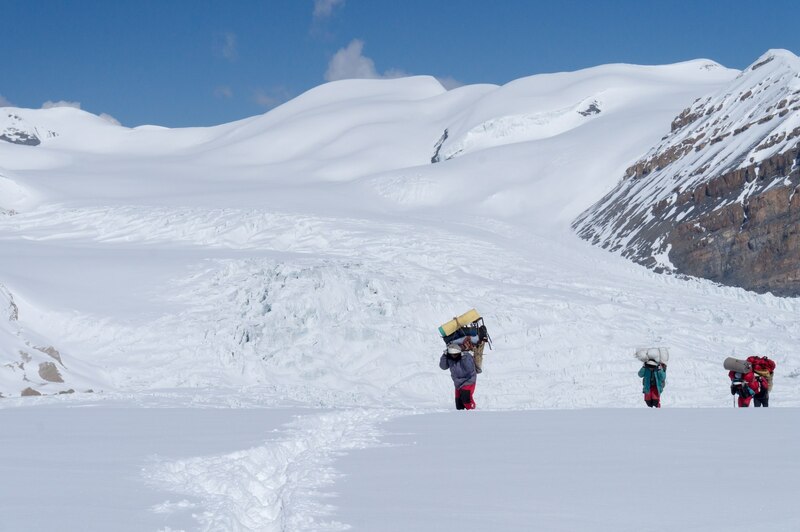 is quite the workload, especially for those porters who were not much older than 16 and on their first trek. It must also be said that there were older and experienced porters and the sirdar himself who all on occasional lightened the load of a flagging porter. Our entire crew was Tamang and had been hired by the sirdar. Those jobs may be more attractive to unskilled and poorly educated male youth entering the labor market. Just how much does a trekking porter make a day? My guess of 2000 rupees a day (that is about $20. US) was not confirmed by the guide. The Australian adventure travel company that organized my trek, World Expeditions, does have a page dedicated to porter welfare (see here). 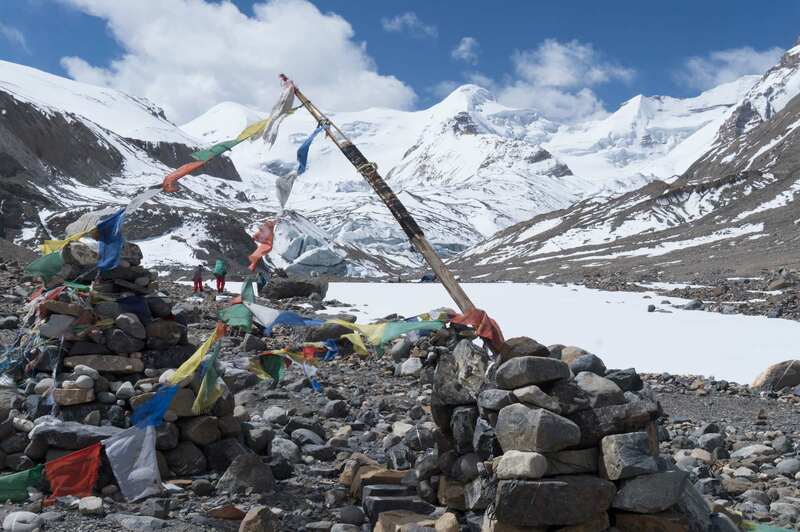 The Nepalese agency which actually ran the trek – Highland Excursions – did provide its porters with clothing, boots, and everything else mentioned in the World Expeditions porter welfare page.